How much money a person is ready to part with for rent is indicative of the lifestyle the person wants to maintain. The brand of the mobile phone a customer carries may reveal the amount of house rent they might be willing to pay. 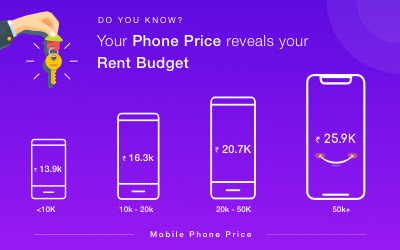 A recent study conducted by Housing.com and Makaan.com, indicates that customers using a phone that costs more than Rs 50,000 would be willing to pay 20% higher rent with an average budget of Rs 25,000 per month. Data from the study suggest that on average, a user with a phone price bucket (PPB) of less than Rs 10,000 would be ready to pay anywhere between Rs 10,000 to Rs 17,000 per month depending on the city with an average budget of Rs 14,000 per month. The study indicates that customers who own a phone between Rs 10,000 - 20,000 would likely be willing to spend an average of Rs 16,300 per month on a rental home. Customers who spend between Rs 20,000 to Rs 50,000 on their phone would be willing to pay 27% higher than the previous category and their average budget would likely be Rs 20,700 per month. Mumbai has the maximum average rental at Rs 23,000 per month which is 30% higher than Chennai that offers home at an average rent of Rs 17,600 per month. New Delhi’s average rent closely follows Chennai’s and is at Rs 17,300 per month followed by Hyderabad at Rs 16,400 per month. Kolkata, where average rental rates stand at Rs 11,400 per month is the most inexpensive location when it comes to rent among the major metros. Pune at Rs 13,200 per month is the next pocket-friendly rental hotspot. 45 - 47% of property seekers in Mumbai, Chennai and Hyderabad use a phone that is in the range of Rs 10,000-20,000 to search for homes on rent. However, rental home seekers in New Delhi used a phone in the range of Rs 20,000-50,000 category. About 49% of rental home seekers in Kolkata searched properties for rent with a phone that falls in the bracket of Rs 10,000-20,000. However, the next big bracket is of users who use a phone within Rs 10,000. About 85% of the demand lies within Rs 20,000 per month category. Statistics also show that maximum phone users searching for rental homes own a phone priced between Rs 10,000 to 20,000. The next big category is that of consumers who own phones worth Rs 20,000-50,000 followed by those who own phones priced less than Rs 10,000. The average national rental budget is Rs 14,000 per month and the majority of Indians are looking for affordable rental properties. Following the trend, about 47% of prospective tenants in tier II cities were looking for properties priced between Rs 10,000-20,000 per month. Just like other major metros barring Kolkata, most users have phones in the range of Rs 10,000 to 20,000. About 22% of property seekers, nationally, are looking for homes priced within Rs 10,000 per month. Among major cities, Kolkata has maximum seekers within this range at 26% followed by Chennai at 25%, Pune at 23% and Tier II cities at 22%. In almost all the cities, affordable to mid-priced rental homes are majorly in demand, and less than 2% rental home seekers are likely to want homes priced above Rs 50,000 per month. Within this category, Mumbai (2.44%), Hyderabad (2.42%) and Noida (2.19%) witness the most number of buyers in the premium category of rental homes. Data suggest that these property seekers are either iPhone users or Samsung Galaxy Premium users. Common phones used for property searches include iPhone and Android phones such as Moto G4, Galaxy J Series, Acer Iconia, Lenovo Vibe, Honor, HTC Desire and other brands including Redmi, Oppo, and Vivo. The cities included in the study are Mumbai, Kolkata, Chennai, Delhi, Bengaluru, Hyderabad, Noida, Gurugram, Greater Noida, Pune.